How much do Americans know about science? There’s a new science quiz from Pew Research Center. You can test yourself here. It depends on what you ask, of course. Many Americans understand at least some science concepts on the quiz—most can correctly answer a question about antibiotics overuse or the definition of an “incubation period,” for example. But other concepts are more challenging; fewer Americans recognize a hypothesis or identify the main components of antacids. Our chief goal in asking U.S. adults about science facts and processes is to gauge people’s overall level of knowledge about science. The universe of science facts and concepts is vast. But people who happen to know more questions in this set are also likely to know more about science information, generally. We find striking differences in levels of science knowledge by education and by race and ethnicity. For example, 71 percent of adults with a postgraduate degree are classified as having high science knowledge on the scale, correctly answering at least nine of the 11 questions. This compares with about two in ten (19 percent) of those with a high school degree or less who score high. About half of whites (48 percent) score high on the scale; by comparison, much smaller shares of Hispanics (23 percent) and blacks (9 percent) correctly answer at least nine of the questions. In this era of political polarization and sometimes intense debate over what information is true and false, Republicans and Democrats have roughly similar levels of knowledge about science. Four in ten Republicans (including independents who lean to the GOP) get at least nine of 11 questions correct, as do 41 percent of Democrats and independents who lean to the Democratic Party. The survey questions covered a range of science topics including one on people’s understanding of when to use a control group and another about recognizing a hypothesis. Apart from the questions in the knowledge scale, the survey asked about people’s perceptions of the scientific method. When asked to choose which of two statements best describes the scientific method, 67 percent of Americans say the scientific method is designed to be iterative, producing findings that are meant to be continually tested and updated, while 15 percent say the method identifies unchanging core principles and truths, and 17 percent say they are not sure. There are longstanding concerns in the scientific community about how much the public knows and understands about science. But, it’s important to point out that the role of knowledge and information in public views about science topics is complex. Past studies from the Pew Research Center, using different knowledge questions, have found high science knowledge to be correlated with support for scientific research and trust in scientists working on genetically modified (GM) food issues. But people’s beliefs about many science-related issues are not connected with their levels of science knowledge. One example: public views about whether to mandate the measles, mumps and rubella vaccine for schoolchildren. Further, on strongly-politicized topics, such as climate and energy issues, science knowledge tends to have a more nuanced, indirect role. For example, in a 2016 Pew Research Center survey, science knowledge was connected with Democrats’ but not Republicans’ beliefs that climate change would lead to harms to the Earth’s ecosystems. 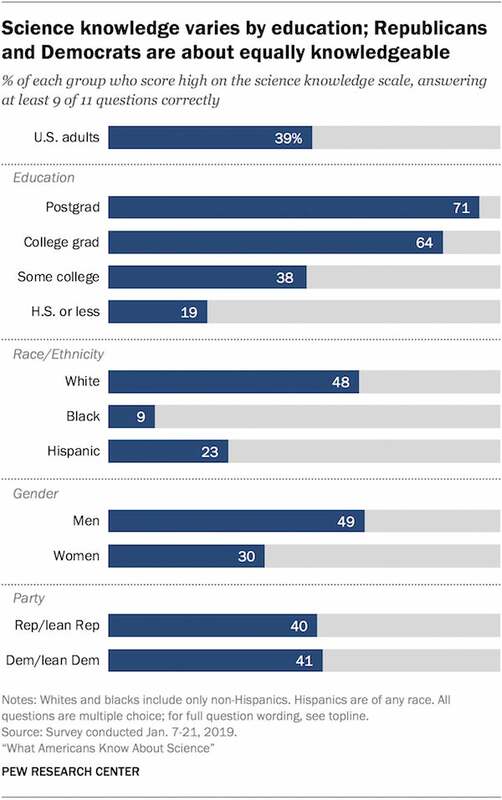 Similarly, the vast majority of Democrats with high science knowledge agreed that climate change is mostly due to human activity. In contrast, about half of Democrats with low science knowledge thought this was the case. But Republicans with high levels of science knowledge were no more likely than those with lower levels of knowledge to think climate change was mostly due to human activity. Political orientations—whether Democrat or Republican—appeared to shape how people integrated science knowledge with their attitudes and beliefs about a range of climate and energy issues. While the relationship between people’s attitudes and their level of science knowledge is complex, science knowledge can be important for individuals, communities and the citizenry, as a whole. As a practical matter, science knowledge can help individuals navigate a variety of everyday situations, such as making health care decisions or deciding what to eat. Communities can benefit from higher levels of science knowledge, particularly as they make sense of potential health hazards in their environment. And as science continues to advance and new scientific debates emerge on issues such as gene editing, a more informed citizenry is seen as better able to make sense of this information and engage in civic discourse around these topics. Is Meghan Markle’s Family Drama Stressing Her Out Too Much?